The end of the story isn’t the end of the line for ranch-bred 4-year-olds. 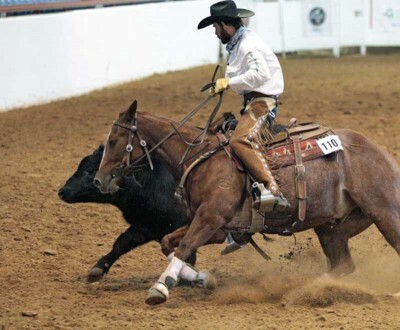 Matt Koch circles on Dual With A Shiner during the Zoetis AQHA Ranching Heritage Challenge in Fort Worth Texas. Matt Koch – Dual With A Shiner, aka “Diesel” 2011 sorrel gelding (Reys Dual Badger-Miss Shining Dear by Shining Spark), bred and owned by Wagonhound Land & Livestock diesel got some time off during Christmas, and then we went back to exercising him. I roped the mechanized dummy a bunch, just to give him something fun to do for exercise. One or two days, I actually roped out of the box on him and stopped some steers. I just backed him in the head box a couple of times and ran a few and scored a few. I was pretty happy with him at the Ranching Heritage Challenge. He wasn’t as good as he could have been, but he didn’t embarrass us. And I caught, so I held up my end. I used to have heck with the thought of missing, but now I take the same exact shot every single time. I take my cattle to the left, like a team roping run, and I’ll keep them about a stride further behind than if I was going down the fence. The horse just rates in that spot, just a touch to the side. I look to see when the yearling steer is going to be running the truest and straightest, and as soon as it looks like it has hit a consistent, cadenced stride, that’s when I try to fire. At home, schooling a horse around, I want my horse to run on a loose rein. I don’t want to have to be pulling or holding him. It’s the same thing as in the fence work: When I turn the corner, I might have a little contact, but I’m not having to keep him from running. In roping, I drop my hand and the cow carries the horse forward. My horses all know that. As soon as I throw and get the yearling gathered up, when I sit down, the horse should go to the ground. I’m pretty pleased with Diesel. I’ll probably show him again in Houston (in March at the next Zoetis AQHA Ranching Heritage Challenge). We’ll keep hauling him as long as he keeps winning and paying his way. When he’s tired of showing, he’ll make a nice using horse on the ranch.